In the days before Netflix, television, radio, and moving pictures, the theater was the place to go for entertainment. 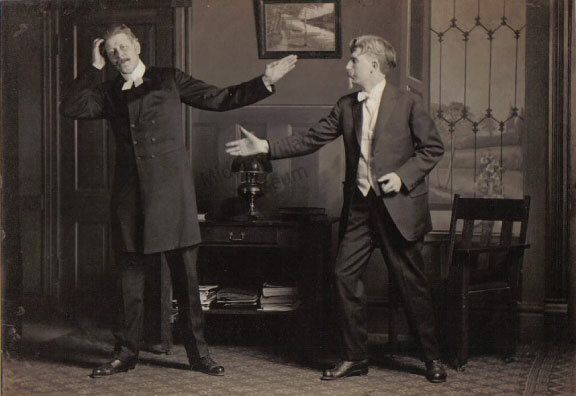 The Swedish Theater of Rockford was born from the Independent Order of Odd Fellows in 1911 when Hjalmar Fryxell (left) and J. Herman Hallstrom, who later became mayor of Rockford, formed the group. Carl Bruce, who had previously acted with a traveling theatrical company in Minnesota, joined the theatrical group early on. Bruce acted and created the sets. Fryxell wrote a few plays as well as yearly revues of Swedish Rockford performed by the players. Carl Bruce in his Sven pa Lappen (Sven on the Patch) persona. He performed comic monologues as Sven in Swedish communities and organizations throughout Northern Illinois. 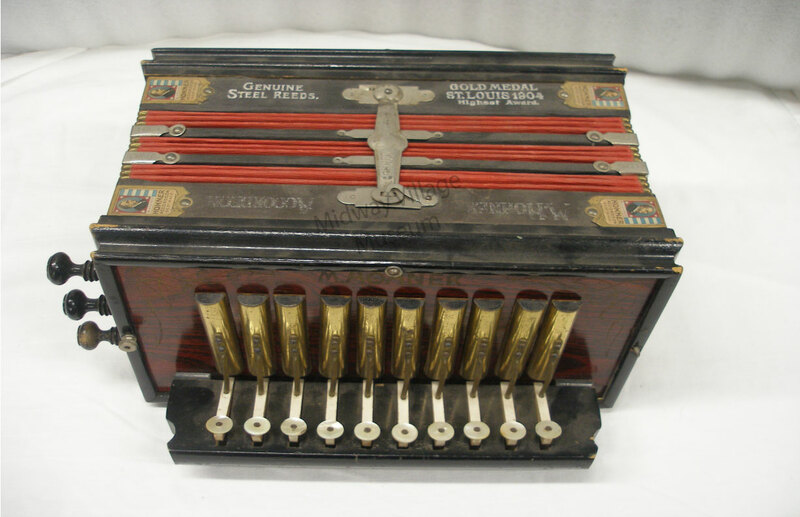 Carl Bruce played this M. Honer accordion as part of his Sven persona. 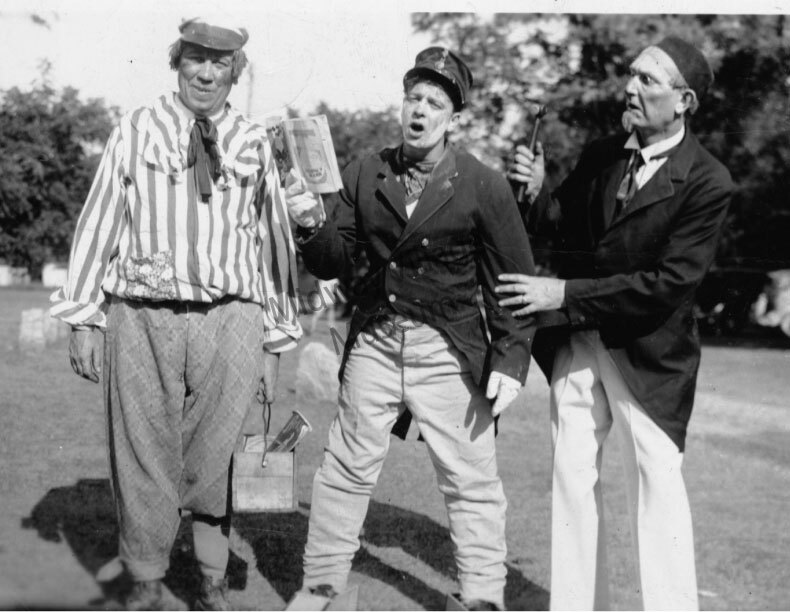 Carl (left) was born in Sweden on July 19, 1887. 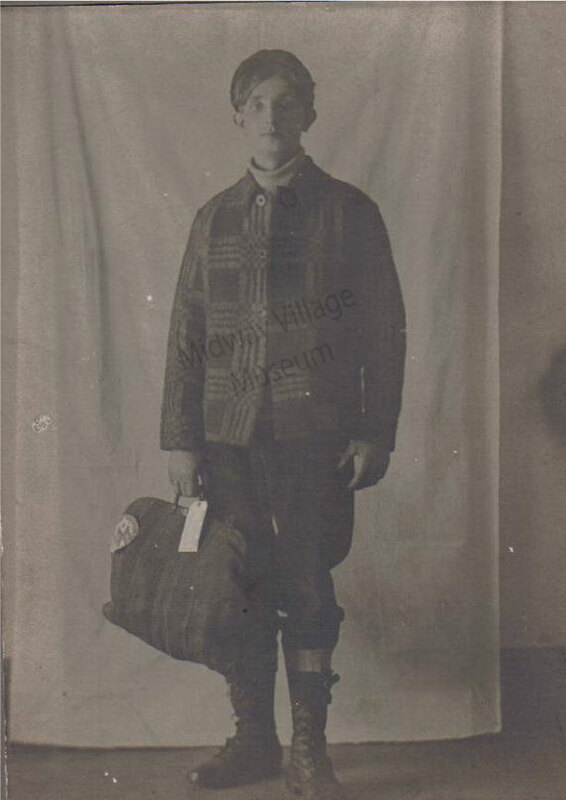 He immigrated in 1903 and became a naturalized citizen in 1916. He married Wilma Peterson around this time, who was an actress in the Swedish Theater. Born in Rockford to Swedish immigrants, Wilma (right) worked at the National Lock Factory as a Fore Lady who supervised a department of young Swedish women. Carl worked at National Lock as a machinist. 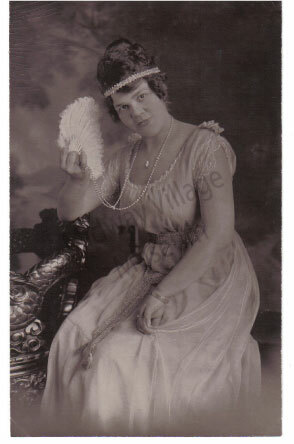 Wilma passed away in 1933. Gunnar Edstrom (left) and Carl Bruce put on acts together from the late 1920s to the 1950s. Actress Alma Nelson (below) helped her husband, Albin, operate Nelson’s Home Bakery at 7th Street and 5th avenue. 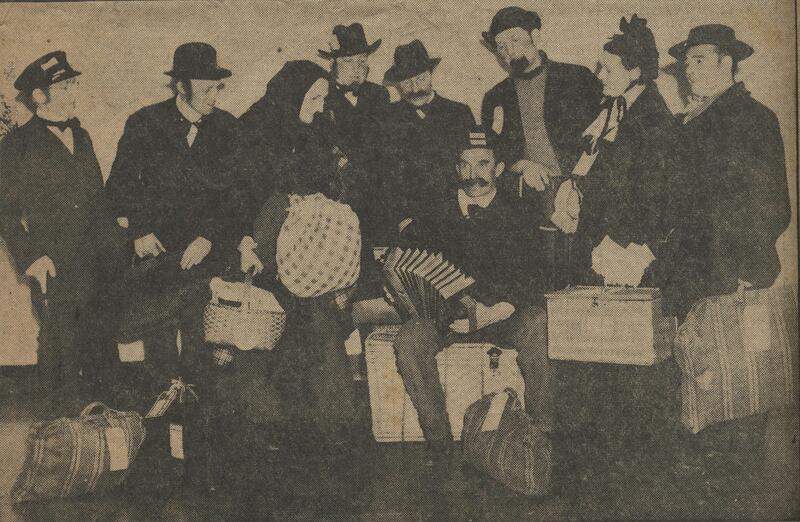 Group photo of the Swedish Theater of Rockford players performing as Swedish immigrants. Carl Bruce is seated with his accordion that he used as Sven pa Lappen. 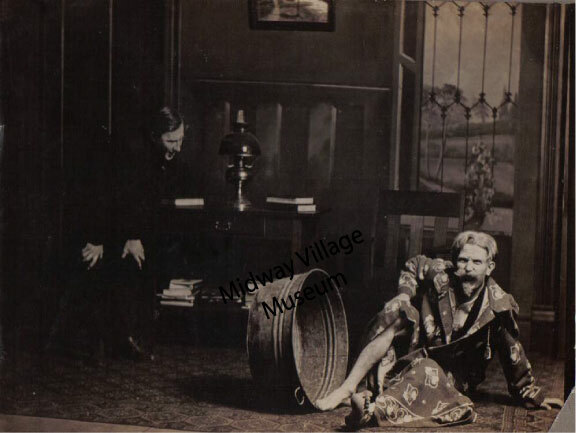 Scene from a production. Carl Bruce is on the right. Scene from a production. 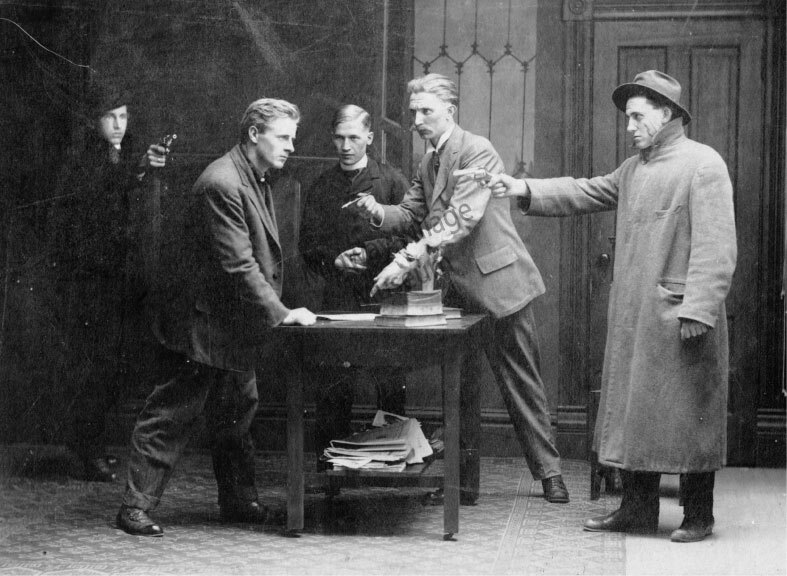 Carl Bruce is second from the right. Group photo of Swedish Theater of Rockford players. 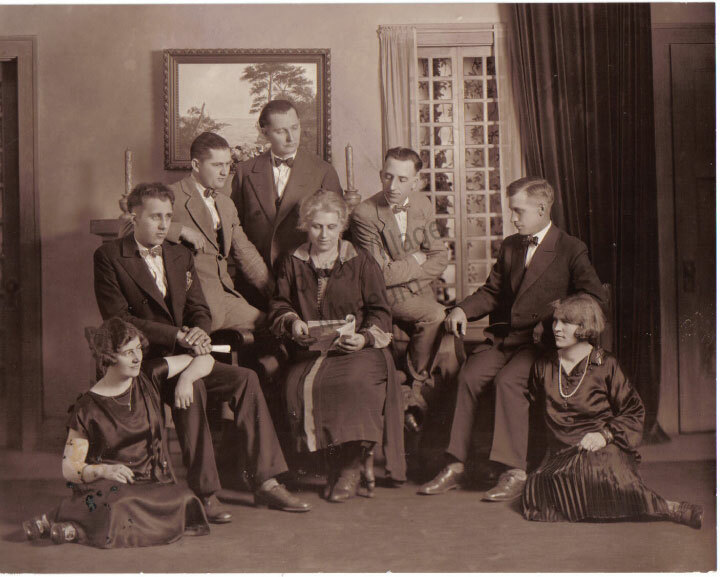 Wilma and Carl Bruce are at the far left, Hjalmer Fryxell is third from right, and Alma Nelson is at the far right. 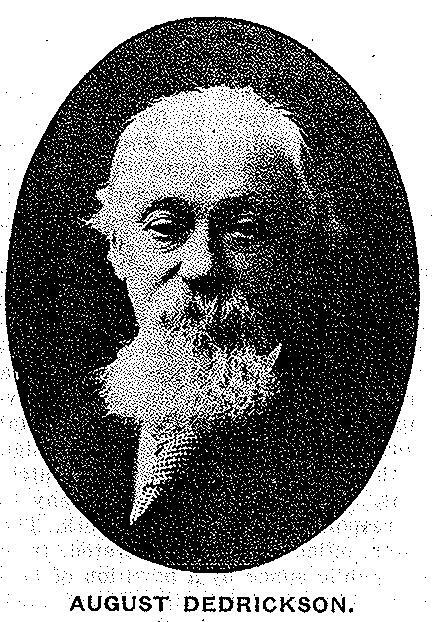 William F. Cody was born in Iowa in 1846. When he was just a boy, his father moved the family to Kansas, settling near Fort Leavenworth. Cody was naturally skilled in shooting and riding, and at the age of 14, became a renowned pony express rider, a dangerous occupation on the plains. The advertisement called for “skinny, expert riders willing to risk death daily.” Clearly not one to be left out of the excitement, he served as a Union scout during the Civil War as part of the Seventh Kansas Calvary. 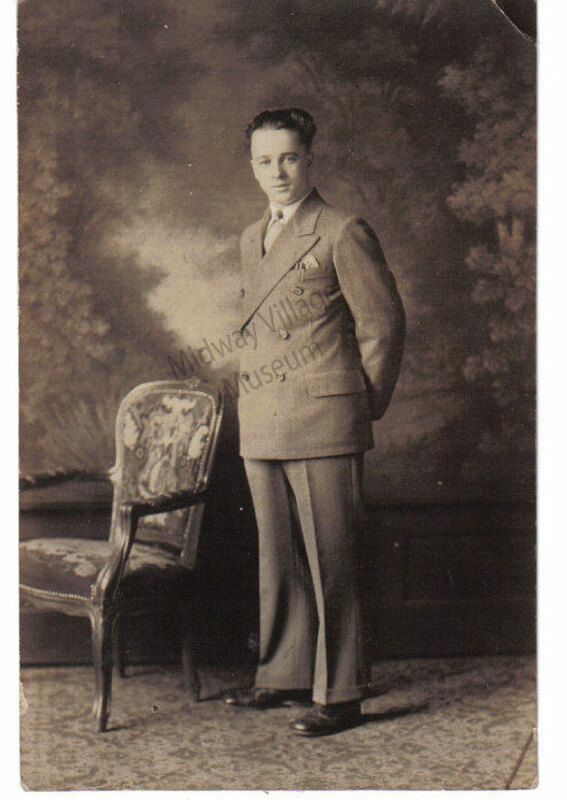 Cody continued to serve the Army after the war as a scout and dispatch rider. In 1867, Cody began hunting buffalo to feed the Kansas Pacific Railroad workers. In seventeen months, he had killed 4,280 buffalo. It is believed that he took up a contest with William Comstock to see who could kill more buffalo in eight hours. With Cody’s 69 to Comstock’s 46, Cody earned the nickname Buffalo Bill. His reputation as Buffalo Bill grew into that of a national folk hero. 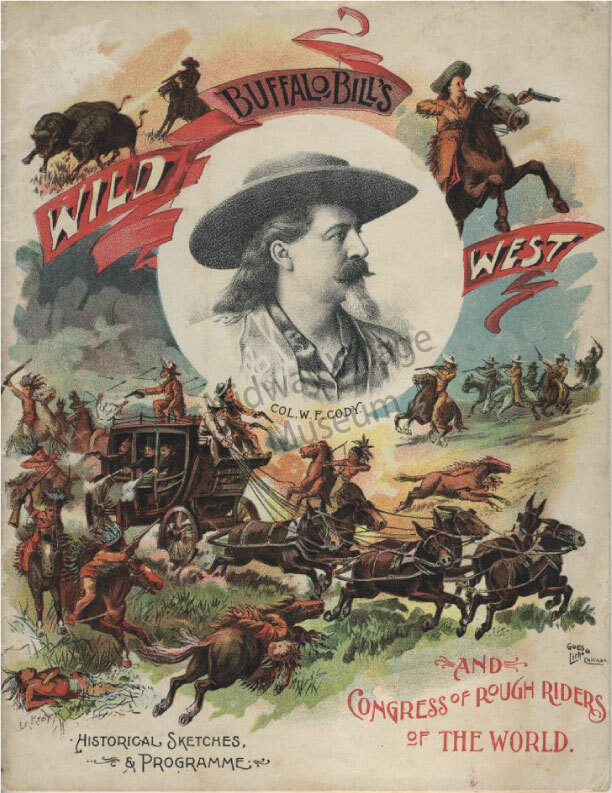 Ned Buntline’s dime novels featured Buffalo Bill along the ranks of Davy Crockett and Daniel Boone. In 1872, Buntline even persuaded Cody to appear in his play The Scouts of the Plains, which was a great success thanks in part to Cody’s natural showmanship. Riding on this achievement, Cody organized Buffalo Bill’s Wild West in 1883. The show dramatized frontier life with buffalo hunts, Indian attacks, the Pony Express, and a presentation of Custer’s Last Stand. His show featured stars such as Annie Oakley, Buck Taylor, and, for one season, Chief Sitting Bull, the “slayer of Custer.” He added the Congress of Rough Riders of the World that featured cavalrymen around the world, including Mexico, Russia, and Syria. The show toured for thirty years, even travelling to Europe. Buffalo Bill’s Wild West show even made it to Rockford in 1901! 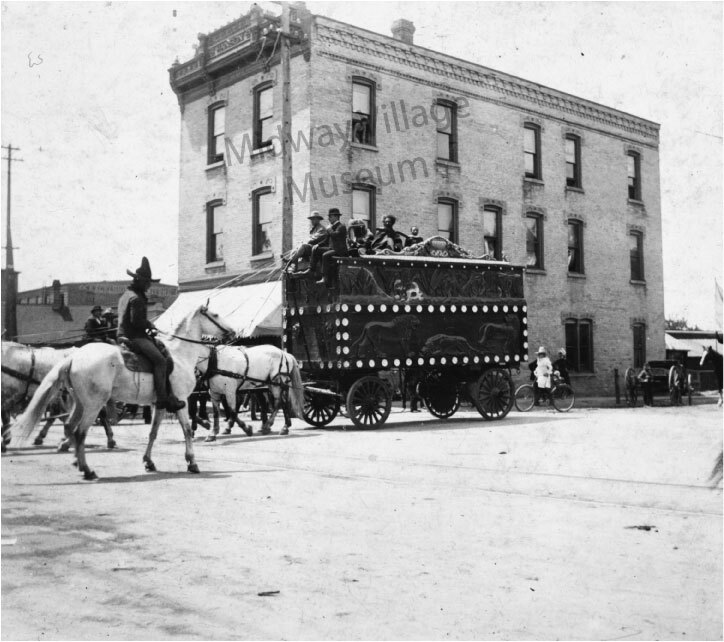 The show then returned for Rockford’s Chautauqua events, the first of which was held in August 1902 at Harlem Park. The Chautauqua was advertised as a place of learning for adults: “A School for Out-of-School People.” It was a two-week long event that offered lectures on cultural and political topics, women’s topics, and global topics with speakers from all over the country. Musical performances could be heard, including music from the Third Regiment Band every evening. Kindergarten classes were taught for younger children, as well as art, cooking, and elocution classes for adults. Sundays offered church services and Sunday School. And of course, Buffalo Bill and his Congress of Rough Riders were there to thrill and impress the crowds. 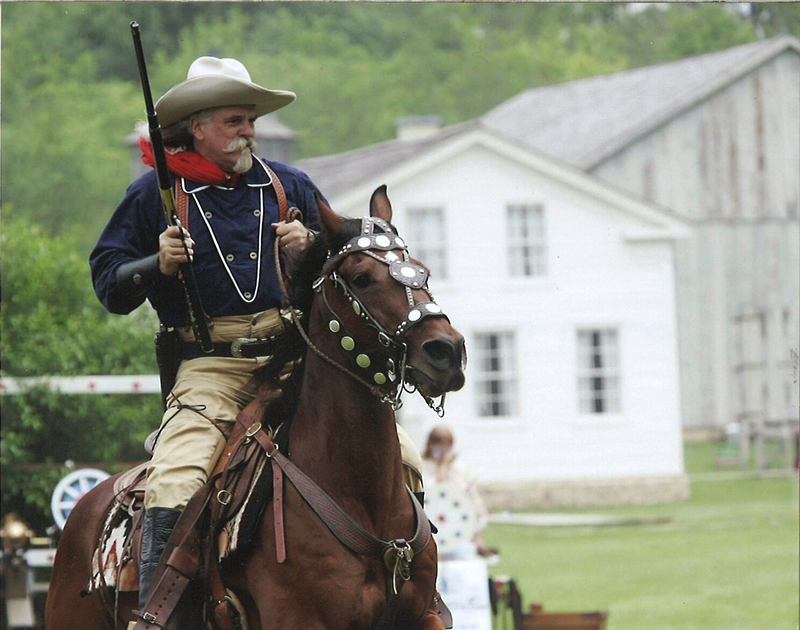 See for yourself Buffalo Bill Cody’s Wild West Show featuring Annie Oakley at Midway Village’s 1900 American Chautauqua! Meet Theodore Roosevelt as portrayed by nationally known Joe Weigand as he campaigns for the 1900 Republican Party ticket. Thrill to demonstrations of sharp shooting, trick riding and Native American Indian demonstrations at Buffalo Bill’s Wild West and Congress of Rough Riders of the World on the Midway Village Green with two shows on Saturday (12:30 p.m. and 3:00 p.m.) and one on Sunday (2:30 p.m.) along with a wide variety of other popular activities, presentations and entertainments of the times. The 1900 America event will include live period music featuring Mark Dvorak on Saturday and Rockford’s own Betsy Kaske both days in the Midway Village church. View demonstrations of antique high-wheel bicycles by the Illinois Wheelmen and Wisconsin Wheelmen and horse drawn wagon rides. Participate in classes in the art of 19th century military sabre and pugilism taught by Allen Reed, Headmaster of Gallowglass Academy and Professor of Antagonistics, Leaf River, Illinois. If you play the violin, this instrument may look familiar. But if you’re someone like me, who only took three years of piano lessons as an elementary student and can barely hammer out a few Christmas songs on my parents’ piano (much to their chagrin), you may wonder what this strange object is. 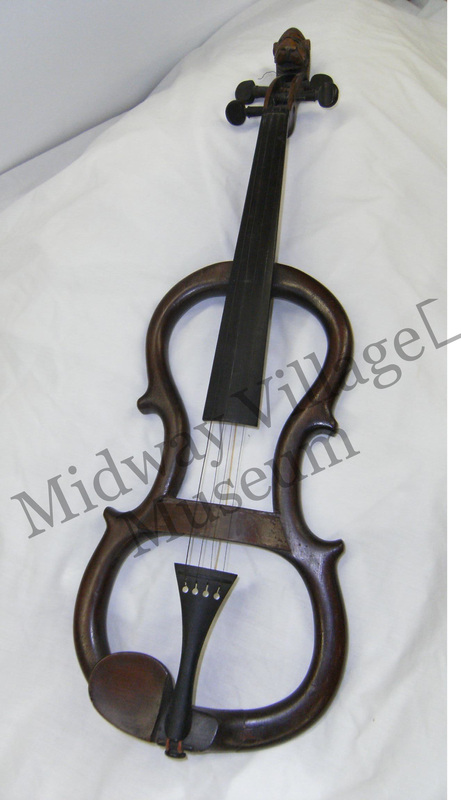 It is a practice violin believed to be from the 1850s. 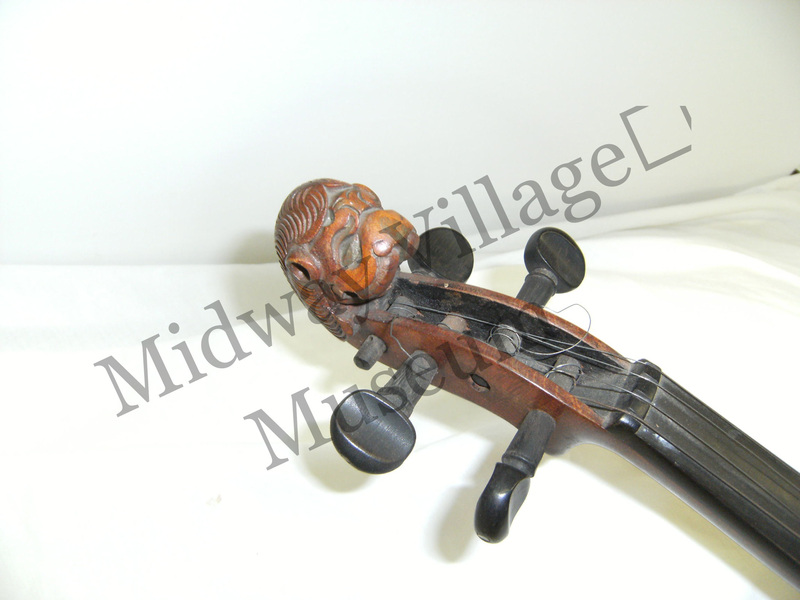 This practice violin has a wonderful carved animal head as its scroll. Practice violins have been played since the eighteenth century. Sometimes called a silent or mute violin, it is hardly that. The strings vibrate in the air when played with the bow causing sound; however, because this violin does not have a resonating chamber, the sound is not very loud. Instead of being played for performances, this violin would be good to practice with when you do not want to upset your neighbors or fellow family members. This particular practice violin was owned by Rockford musician Augustus Dedrickson. 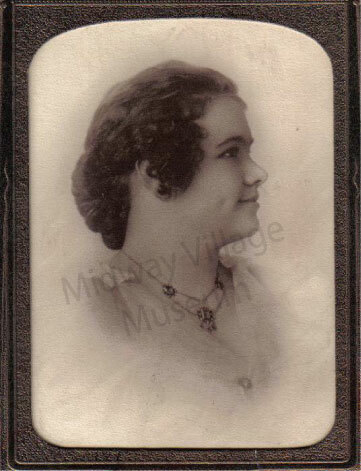 August immigrated to Rockford from Germany in 1854 at age 24. He served in the Civil War as a musician in the 11th Illinois Infantry Band. He enlisted on September 23, 1861 and was discharged July 29, 1862. 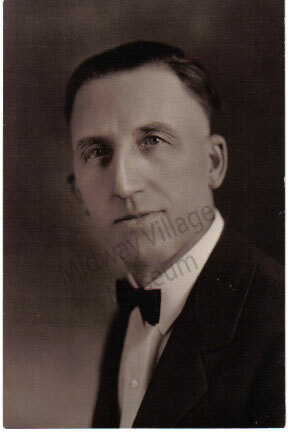 August Dedrickson is considered a pioneer band and orchestra leader in Rockford. In 1867, he organized and led the Forest City Band while participating as a cornetest. His Opera House Orchestra was an outgrowth of the Forest City Band. He led both for thirty years. Eventually, the Forest City Band’s named changed to the Rockford Watch Company Band and later to the Third Regiment Band. Not only did August play several instruments, he built, repaired, and sold them as well. 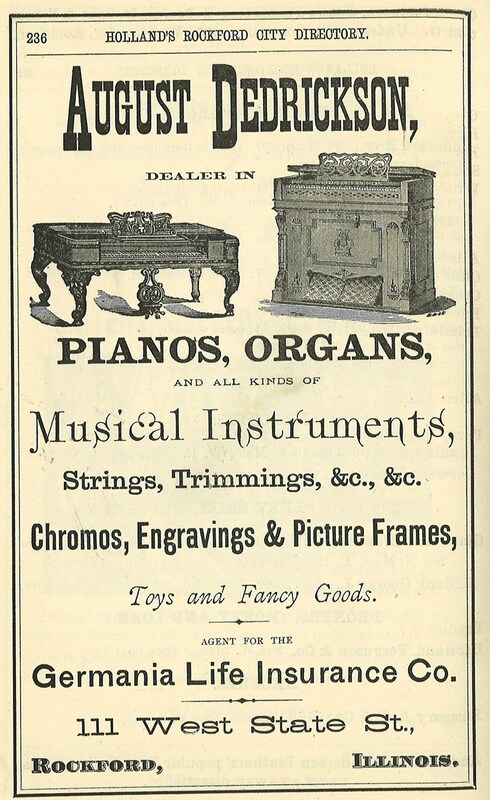 This ad appears in the 1874-1875 Rockford City Directory. 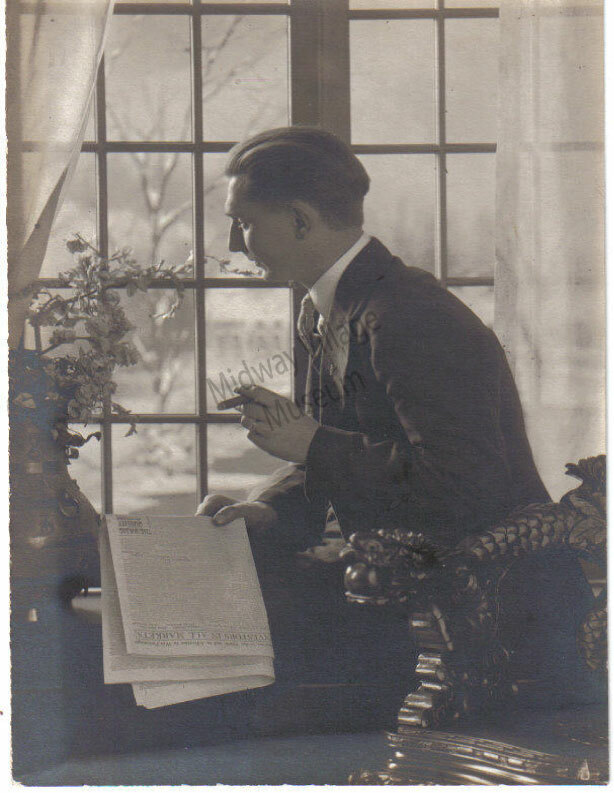 According to the ad, he also sold engravings, picture frames, and toys, as well as acting as an agent for the Germania Life Insurance Company. This ad from the 1885-1886 Rockford City Directory promotes another community role played by Dedrickson. He provided bass and string music for different events such as parades and dances. Practice violins like August’s are far from outdated. They can still be purchased in music stores today. While they haven’t changed too much in terms of design and appearance, there is more the violinist can do besides avoiding complaints from the neighbors. This is a SV-150 Silent Practice Plus Violin from Yamaha. 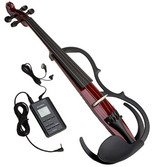 Now the practice violin comes with a control box featuring a digital tuner, digital metronome, and over 20 digital sound effects – more than I’m sure August Dedrickson could have ever dreamed.